Goodenough Club does its best to provide a home from home for visiting academics and those in the not-for-profit sector. If you are in this sector you are likely to love the collegiate environment of this quiet garden square in the heart of Bloomsbury. Guests can look forward to several acres of private gardens with tennis court, childrens play area and barbecues. There is a comprehensive programme of free talks, lectures and concerts and enjoy the fertiole creative atmosphere created by a community of 550 international postgraduates from over 90 countries. The property is within easy walking distance of the West End, the academic and legal centres and just seven hudred yards from Kings Cross. 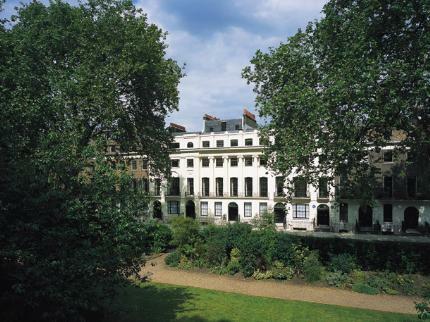 Four star accommodation with views over the beautiful Mecklenburgh Square gardens. A continental breakfast is included in the room rate and served in the Club Guest Lounge.